It's Menswear Monday! 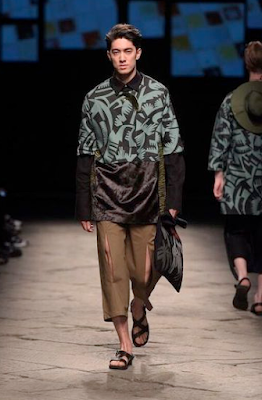 I hope many of you were able to catch views of various shows from Pitti Uomo last week. For those of you who do not know Pitti Uomo is an international menswear fair that is held in Florence. 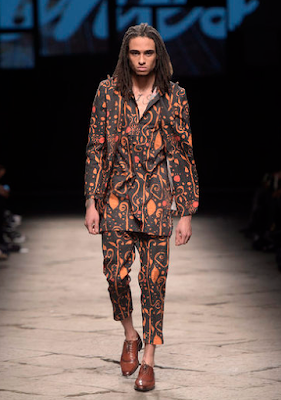 As part of "Generation Africa," a collaboration between Fondazione Pitti Discovery and ITC Ethical Fashion Insitute, four African designed fashion brands were able to showcase their collections. AKJP, Lukhanyo Maingi x Nicholas Coutts, Ikire Jobes and U.mi-1 were the second group to showcase their collections during Pitti Uomo. The first group did so in 2015. Something else special occurred last week during a show that was curated in a way to highlight African fashion talent and migrant issues faced by Europe. 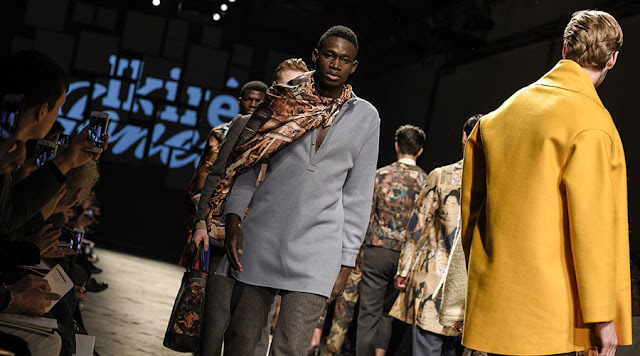 Three asylum seekers were able to participate on the runway as models due to a partnership between the Ethical Fashion Insititute and Lai-momo: an Italian organization that specializes in working with migrants. The Ethical Fashion Institute promotes the idea of a global fashion industry that strives towards diversity by providing skills to all individuals who wish to join the industry. Head of the Ethical Fashion Institute Simone Cipriani expressed her sentiments after the show last week saying, "Africa is one of today's creative poles and this show proves that African designers speak about art, life, and innovation. At the same time we are in an age in which many Africans come to Europe as migrants. We believe in a program that enables them to work in a fair value chain of fashion." As the fashion industry continues to embrace globalization, more individuals are advocating for the diversification of models and cultural representation on the runways. This show and incorporation of the four African based fashion brands reaches towards that idea of diversity not only in our industry alone but displayed in the representation of collections and models. I definitely appreciate programs like the Ethical Fashion Institute who realize the need to share their love for the fashion industry with anyone who has the skills and passion to make it. I definitely wanted to share this post with my readers once I heard about it, but decided that Martin Luther King Jr.'s day would be the perfect opportunity. Dr. King left his mark not only on this country but on our world with his stand against racism and discrimination. As he has said, "Our lives begin to end the day become silent about things that matter," and "Darkness cannot drive out darkness; only light can do that. Hate cannot drive out hate; only love can do that." What were some of your favorite runway looks from Generation Africa? From Pitti Uomo as a whole? Who is currently inspiring you to diversify your way of thinking? Where do you see the fashion industry on the subject of diversification in the next year? If you loved this article don't forget to share on social media Twitter:@thestrongsuit_ & instagram @thestrongsuit!